Two Simple Rules Keep Your Bedroom Feeling Calm & Clutter-Free - Spaces Streamlined Home Staging, Styling and Organizing Gig Harbor, Tacoma and surrounding areas. Would you love to create an oasis of calm apart from the busy everyday happenings in your home? 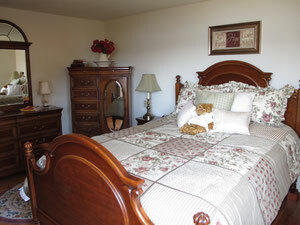 Put two simple rules to work in your bedroom to begin and end each day in a restful and peaceful-feeling space. A recent client was feeling overwhelmed by clothing and miscellaneous things cluttering the floor of her bedroom and called upon me for help. It was a lovely room with beautiful furniture. She had actually purchased a new comforter set months before but hadn't felt motivated to put it on the bed because of the clutter crowding the space. After a short discussion we decided to start there and began by removing everything on the bed and dressing it with fresh sheets and the new bedding. What a difference a tidy and beautiful bed made in the room! Already this woman was feeling better and ready to tackle all of the clothing and items on the floor. After spending a couple of hours sorting and eliminating some of the clothes and other things that were no longer needed and finding homes for everything else, my client has a serene and restful place to welcome her each morning and evening as she begins and ends her busy days. It's amazing how having this beautiful room has transformed her feeling about her home- she feels so much better and as if a weight has been lifted from her. When I next visted her a couple of weeks later, she showed me how she'd kept her room looking wonderful, even adding a cute chair in the corner and some new flowers in a vase. As I looked about this cozy and clutter-free space and congratulated her on keeping it so nice she happily turned to me and told me she has two new rules for herself: "Clothes are not allowed to touch the floor and I make my bed every morning before I do anything else". Placing her clothes in her closet and making her bed faithfully each morning have made keeping her room organized so much easier for her. Seeing that beautifully made bed each time she enters inspires her to put things away and maintain the peaceful space she has made for herself. If you'd like to have your own serene retreat try putting these two simple rules to work for you (they'll soon become habits) and you'll have a neat and clutter-free bedroom you can enjoy every day.